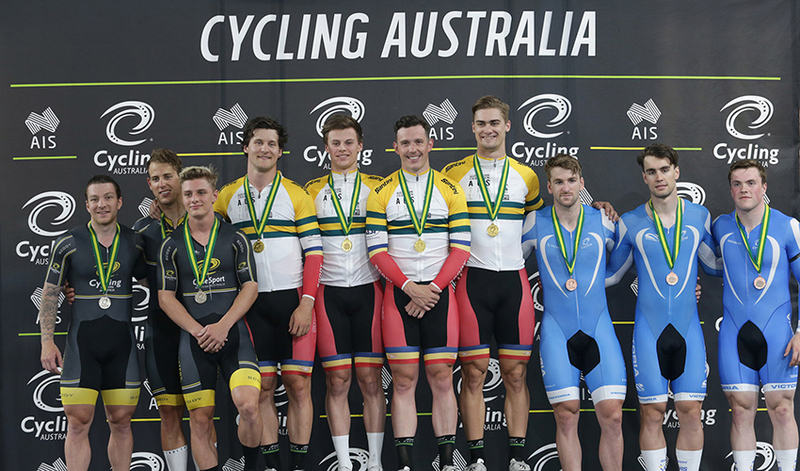 Former gymnast Matthew Richardson claimed silver in the team sprint on the opening day of the 2018 Australian Track National Championships at the Anna Meares Velodrome, Thursday February 1. Having taken up cycling less than four years ago when an elbow injury put his gymnastics dream on hold the 18-year-old's talent on the bike was quickly evident with Australian and Oceania titles as an under 19. Representing Australia at the UCI Junior Track World Championships last year, and only making the step up to the elite ranks at the 2018 Oceania Track Championships in November. Part of the winning team in the under 19 category in 2017 with Kye Bonser and Julian Krohn, Richardson has wasted little time putting his name forward as a future sprint star in the elite ranks. "I'm very happy with that. It is good to get a good time with the boys considering we only had one training ride together yesterday so to pull together nicely today was pretty good," Richardson said. Richardson was joined by the experienced Luke Zaccaria and Olympic silver medallist and world champion in the team pursuit Sam Welsford, who put his endurance focus to one side to allow Western Australia to field a team. Despite the limited riding together there was no sign of the trio's limited racing together. "We worked together pretty well. Sam has that bit of a sprint in him being a bunch race rider and Luke and I train together a lot, so we came together nicely." The strong ride by the team was an added bonus for Richardson who was particularly pleased with his opening lap from a standing start of 17.7 seconds. "I have been working for that lap for a while so for it to come together in competition was good as I have really been training for it so to get that PB was really good," he added. With a medal in his first elite nationals Richardson now turns his attention to the sprint and keirin where he will be racing some of the best in the world including world championship medallist Matthew Glaetzer and defending champion Patrick Constable. Despite the challenge of stepping up to race people with years of experience Richardson heads in with confidence knowing he has made a strong start to his elite career. "It does give me that bit of confidence and a boost as well knowing I am going to be racing against bigger guys coming out of under 19s so it is a good start." While approaching the week looking to learn as much as possible he has set himself two goals for the rest of the week that will see him continue his development. "I would like to do a PB in my flying 200 and make it through the first round of the sprint on Saturday and make it through to the keirin final as well."